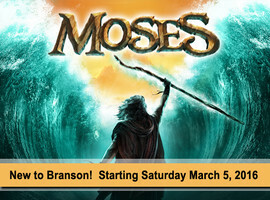 Lauded for prior offerings such as Jonah, Sight and Sound Theatres delivers another biblical epic with its production of “Moses.” Some of the Old Testament’s greatest stories, including the parting of the Red Sea, are part of this multi-faceted production, which includes dozens of performers, world-class stage design and live animals. The show begins in March and runs through December. Acclaimed illusionist Reza brings his artistry to The Starlite Theatre, where “How’d he do that?” will be a common refrain in 2016. Known for his large-scale illusions and his sleight-of-hand street magic, Reza is quickly gaining a reputation as one of the world’s top illusionists. Want to see a sample? Check out this video of his amazing Oreo trick. Reza performs select dates March-August. This is one of the most patriotic shows staged anywhere in the U.S. Set in 1942, “All Hands on Deck” focuses on The Victory Caravan – a real-life effort that saw Hollywood stars touring the U.S. by train in an effort to sell war bonds – and features four main players, backed by a nine-piece orchestra. The show was created by Jody Madaras as a thank you to those who served our country. The show is staged at the Dutton Family Theater; it runs on select dates March-May and September-December. The holidays are going to get a little crabbier, in the best possible way, when Maxine – the feisty, cranky character popularized by Hallmark cards – takes center stage in this hilarious adaptation of “A Christmas Carol.” The show will have everything you’d expect, with songs, ghostly characters and, of course, Maxine’s canine companion Floyd. The show runs Nov. 1-Dec. 10 at the Andy Williams Performing Arts Center. Songs of faith, family and love are at the heart of this 10 a.m. show featuring the legendary Blackwood family. R.W. and Donna Blackwood, along with their daughter, Andrea Blackwood Carter, entertain with gospel, country and patriotic tunes. The show includes a generous dose of storytelling and humor. The Blackwood family appears at the Starlite Theatre on select dates March-December. With more than 40 theaters, including those on the famous Highway 76 Strip, Branson has long been known as one of the country’s top destinations for live music shows. Make family-friendly entertainment part of your Branson getaway and use ExploreBranson.com to start planning your trip today. Buy Experiences, Not Things Forever Young - A newer Branson show that is going to take the town by storm!